Place chocolate sandwich cookies in a food processor and pulse until fine crumbs form. Pour into a bowl. Roll scoops of ice cream into the crushed cookie mixture. Place scoops in a baking dish, separated so they do not touch, and place in the freezer for 20 minutes. Meanwhile, prepare the garnishes if you would like to make these into a dessert sundae. Microwave strawberry fruit spread and water together in a small glass bowl until runny and drizzling consistency, about 50 seconds. Slice bananas and strawberries. Place oil in a small pot, heat over medium-high heat. When the oil is hot, remove prepared ice cream balls from the freezer. Use a small ladle or large spoon to carefully and slowly place the ice cream balls into the hot oil. Fry for 5 seconds and remove quickly to serving dish. Repeat until all ice cream is finished. Top each ice cream ball with strawberry glaze, fudge sauce, sliced fruit, whipped cream and sprinkles. Serve immediately. 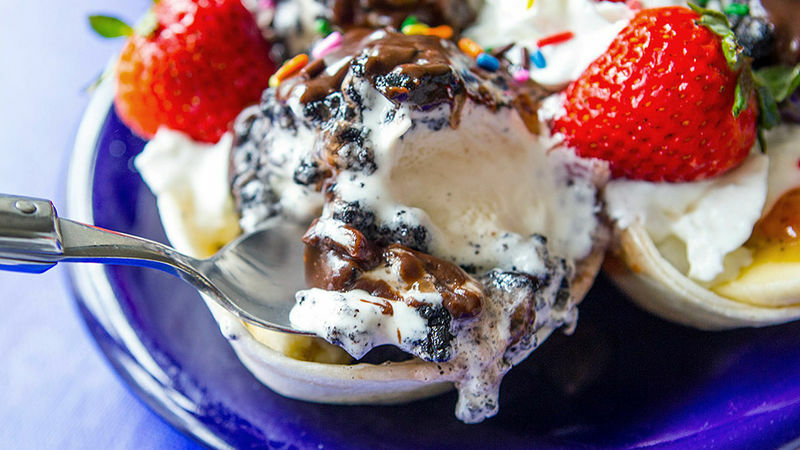 Scoops of ice cream, covered in chocolate cookie crumbs and deep fried. Believe it. Ever ordered fried ice cream after a restaurant meal? I know, right?! Every time I order it, I wish I could make it at home. A crispy, crunchy crust hiding a melty cool mound of ice cream. There are so many things right here. It all starts when you crush chocolate sandwich cookies and spin giant ice cream scoops into the crumbs. Once covered, I popped the ice cream scoops back into the freezer so I could prep the rest of the sundae stuff. Next, a quick prep of strawberry topping. Cascadian Farm organic strawberry fruit spread gets heated with a bit of water to thin it out. In 30 seconds, you’ll have a deliciously drizzly strawberry topping ready to go. You’ll also need bananas, hot fudge and sprinkles to add to your finished ice cream balls. With everything ready, it’s time to fry! Pull your cookie-covered scoops from the freezer, and carefully add them to hot oil for 5 seconds. It goes quick! Stay close so you can get them in and out fast. Top with whipped cream, strawberries, hot fudge, and strawberry sauce – and anything else that makes this the sweetest treat ever. Sprinkles finish it all off. Just like that – delicious, splendid, and totally fun to make!